The stunning Climatron® conservatory has become a symbol of the Missouri Botanical Garden. The geodesic dome was inspired by the design of R. Buckminster Fuller. 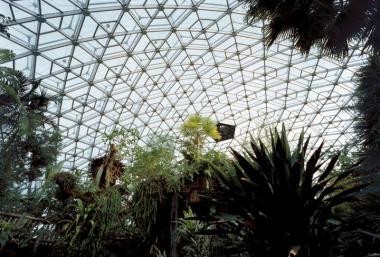 Covering over a half-acre, the Climatron houses some 1,200 species of plants in a natural, tropical setting. Visitors enjoy bananas, cacao, and coffee trees, plus a collection of orchids and epiphytes. The Climatron is also home to a variety of animals, including tropical birds. Several pools and waterfalls give a sense of lushness, as if visitors were within a true tropical rainforest. The Climatron is ever-changing and is an impressive display throughout the year. Learn about plants and their roles in global and regional ecosystems with computerized, interactive exhibits in the attached Brookings Interpretive Center.